What is Microfilm, And Why Do Businesses Use It? Microfilm is a storage method that businesses used in the past to store a large amount of information in a smaller, more manageable format. Microfilm falls within the subset of microform, which envelopes other types of storage using a similar method. While keeping a smaller-sized version takes less room in storing large quantities of files, improper storage conditions can damage your microfilm causing you to lose precious data. 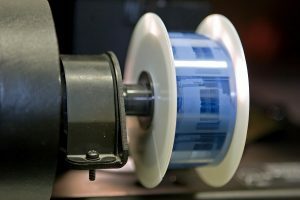 Why Do Businesses Use Microfilm? 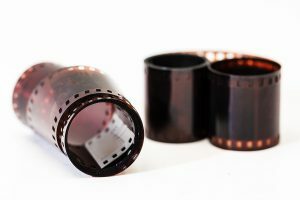 Microfilm was developed to allow businesses to store large volumes of documents in a smaller format instead of keeping the full-sized, original copies. Microfilm is just a picture of the document, very similar to digital images created in document conversion today. The major difference? The image is stored on a film negative which can be viewed using equipment that blows the image up on a screen. Microform creates an exposure of a document, image, or other paper file that is reduced down, typically to 1/25th of the original. The images are then stored in this format and can be viewed using a machine that magnifies the exposure. Microfilm can also be viewed using an eye glass to look at the image if there is light shining through. While it is not the most convenient way to look through multiple files, it is still relevant for certain small use cases. In order to use any data stored on microfilm, microfiche, or other microforms, scanning to a digital format is by far the best solution. By converting to digital records, you can access, copy, organize, and manipulate your files instantly. Microfilm scanning services specialize in converting the tiny microfilm exposures into digital records and can save them to any format, whether you want a hard drive or CD, with ease. Using a viewing device to look through files, one by one, seems hilariously out of place in today’s fast-moving world of technology. Scanning your microfilm allows you to use these records as efficiently as any other electronic document. You can also make multiple copies of your files with ease and store them in different mediums to keep the data safe, from cloud storage to an internal document management system. You can store the original microfilm, microfiche, and other microforms with storage facilities specifically designed to house these exposures with longevity in mind. Specific climate controls that protect the film along with precautions taken against natural disasters, your microforms stay safe and secure. Get microfiche conversion from the experts at Record Nations. Our microfiche conversion solutions takes the stress off your employees and gives you reliable documents you can easily access. We work with a team of experts across the country to provide you with the microfilm/microfiche conversion solutions that your company needs. It is important to find a company you can trust to help you manage your important documents and records. You can fill out the form on this page or give us a call at (866) 385-3706 and within minutes of receiving your request, you will have free quotes from experts in your area that can help you with your records management and backup.